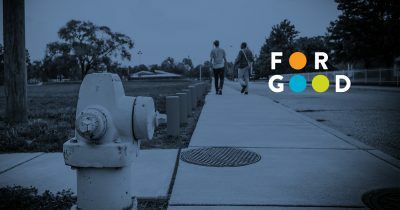 In this special extended episode of For Good, Brian Payne has a candid conversation about CICF’s new mission, explains why the organization cannot talk about equity without talking about race; and shares his personal journey to understand the historic context of institutional racism in America. ANGELA: Transformation. That’s what CICF has been undergoing for a few years. It is seeking a more inclusive community where everyone has an equal opportunity to succeed. So CICF has developed a new mission to help make central Indiana a healthy and thriving community for everyone, not just for some. Hello, I’m Angela Cain with a special episode of For Good. We’re going to discuss CICF’s new mission, it’s impact on our whole community, and much more, and who better to have this conversation with than Brian Payne. He’s CICF’s President and CEO. ANGELA: …so that the community gets to know better what you’re all about. And I’ll ask you, first of all, for people not familiar with CICF, what is CICF and how does it work? BRIAN: We are three community foundations. We’re the Central Indiana Community Foundation, but we’re also the Indianapolis Foundation, which is the Marion County affiliate and the Legacy Fund which is the Hamilton County affiliate. Now, every community foundation pretty much does two things these days. They give grants, and we’ve been doing that for 100 years. And we also help people who want to take their philanthropy, their charitable giving, to a more strategic level. We help those donors do their charity more thoughtfully in a more rewarding way with bigger impact. Everyone does that. All 800 community foundations in the country do some level of that. Where we really are a national leader is on community leadership. And so the third thing we do, and maybe the most important thing, I think, is that we take a big kind of visionary look at the community in partnership and try to make major things happen, things that will not happen without our participation or our leadership or our partnership. And that’s, I think, where we’ve really distinguished ourselves nationally. ANGELA: Why do you think it’s so important to do that? And then we have another privilege. We can take a decade or even a generational long view of an opportunity or a challenge. That’s very unusual. The mayor really has a two to four year view and then they have to worry about getting re-elected. The Community Foundation, you know, we’ve been here for 102 years, we have a lot of money in endowment that gives us an opportunity that we don’t have to live year by year. We live in long cycles. We’re going to be around forever. BRIAN: And so we can take this incredibly long term view on an issue, like opportunity and undoing racism. I mean, we know that’s going to take a generation and we can actually say we’re going to be in this for a generation and, if need be, longer. One thing that’s very clear, we have $811 million overall. $811 million in assets. But we can’t do anything transformative by ourselves. We just don’t have enough money or enough resources. Everything we do that’s important has to be done in partnership, which is the way things should be done anyway. ANGELA: Excellent. And you’re doing that with this new mission, so let’s go there. Your new mission is what and why did it change? BRIAN: So our new mission is about leveraging resources and ideas and partnerships to make central Indiana a more equitable community where every individual has the opportunity to reach their full potential, no matter their place, race or identity. ANGELA: Boy, that’s really big. I love that. It’s so powerful. And what led you to that? Let’s talk about that. What led you to changing this mission? BRIAN: So, our old mission was that we as a community foundation inspire, support, and practice philanthropy, leadership and service in Central Indiana. That’s kind of generic, but it kind of described what we do pretty well. Very well, actually. But what’s changed is the world has changed. The United States has changed. The idea of the American dream was dying in America. This idea, which I’ve always heard about since I was born and felt that it was a very powerful part of America, that no matter the circumstances in which you were born, that if you worked hard, if you delayed gratification, if you sacrificed, if you had grit and discipline and perseverance, that you could become anything. You could be born in poverty and you could be wealthy if you had the talent and the discipline and worked hard enough. I think that mythology, looking back, was really way more true for white people than people of color, but even for people of color in a way, in a significant way, that was more true in the 60’s and 70’s and 80’s and 90’s, and now in this new century, it doesn’t seem to be nearly as possible. So the kids that are born in zip codes that have high poverty, the indication is that not as many as in the past can really dream about pulling themselves up and out. ANGELA: Why? What are you finding out in some of the things you’ve read? What’s the research showing? BRIAN: We just keep seeing more and more and more data that says if you’re poor, if you live in poverty, that there’s so many barriers now to breaking through. Getting through high school is harder. Life is more complicated. But there’s all this data that says people are not doing as well. Another thing we used to always celebrate in America is that the next generation we expected would do better than their parents. And that happened for generations. We seem to be at a point where maybe that’s not going to happen for this next generation. ANGELA: And are you finding the people of color are doing worse? BRIAN: Way worse, right? When we first got into this, we were looking at the data that said people living in poverty, no matter what color, what ethnic or racial background they had, poor people were doing worse. Economically disadvantaged people were not able to have the upward mobility in the past. But then we started looking at other data, and you look at what the barriers are, and I think one of the barriers is that the world has organized itself into tighter networks. And if you don’t have a network, if you’re not part of that network, you don’t even see the opportunity. BRIAN: Guess what the biggest barrier is. Being of color. Why is that? Well I think it’s because race matters in America. We’ve always been pretty comfortable talking about class, but we’ve done that because that keeps us from talking about race. We are not, have not been comfortable in this country or in Indianapolis or Central Indiana talking about race. We’re not an outlier, in Indianapolis. BRIAN: No one has been good about this in America. We don’t know how, we’re not trained, we don’t even learn the real history of racial America. I suppose if you take a black African American studies class in college, I’m sure you’ll learn a lot of it. ANGELA: But how many people take that? ANGELA: It’s by The People’s Institute for Survival and Beyond and it’s hosted by the Child Advocates. BRIAN: They’ve been doing this for years and we finally discovered it through some of our staff members who individually did it. So we’ve sent all 47 of our staff members and the majority of our board members have gone. It is a mind-blowing, experience. I personally came out feeling like, “Wait a minute. I want a refund on my college education.” It’s like, I’m getting a very select part of American history, a very curated part, and a part that doesn’t really go deep into the psychic wounds that we’ve caused to lots of people over generations. I really felt like I want to go back and revisit my education in college when it comes to American history because I was not given the truth. I was not given the full story. And I think my situation is not unusual. I think I’m the norm. ANGELA: I have to say, I attended the Undoing Racism workshop as well. I was doing some work for Child Advocates and attended it, and it examines the history of institutional racism and how communities can change. I found it eye opening as well. BRIAN: Kudos to Child Advocates here in Indianapolis for really making this happen. So one of the things that we know we have to do if we’re going to try to create more opportunity by dealing with the barriers that exist for people of color is that more people need to understand that those barriers have existed historically in America and still exist. We need to understand the barriers and then bring our best selves, our open hearts, to saying how can we make this fairer? I know life isn’t fair, but public policy should be fair, and how do we as a community, as a state, as a country, right the wrongs by creating public policy that gives everyone the opportunity to reach their full potential. You can’t promise people success. You have to bring it, too. It’s like, we’re not just going to lay the red carpet out for people to walk down and be, all of the sudden, super successful. It’s a partnership, and right now I don’t think the community and society in America is bringing their part, because there’s people who can work their tails off and are talented and are disciplined and the barriers are just too great. ANGELA: There are many people who are going to hear you speaking right now and still resist this idea of institutional racism. What do you say that you learned that was sort of eye opening and life changing for you, enough to change the mission here at CICF? That actually that there was this hierarchy of human value. That white people were more valuable as humans. This became a philosophy that was part of creating how America worked and how public policy worked. And it certainly is … If you think about it, obviously was necessary to justify slavery. ANGELA: That was at the heart of it. Is that what you learned? BRIAN: Right. Right. Absolutely. And … But this public policy has gone on and on and on. So okay, so we finally eradicate slavery. President Lincoln and the Civil War. Okay, that’s over in 1865. But then we have policies … Part of the New Deal. Franklin Roosevelt’s New Deal in the 30s and 40s. That might have been a new deal for white people, it wasn’t such a new deal for black people. And so what we learned is that in the late 40s, and after the World War II, and first of all the GI Bill. My dad got to the middle class on the back of the GI Bill. So I grew up middle class. And my dad had a very easy, seemingly, 18 months in the Navy. He joined the Navy just as the war ended in 1945 so he was on an aircraft carrier for 18 months. He was in the service so it’s not just a piece of cake, but he was never on the front lines. He got the GI Bill. He went to engineering school. He got to have a middle-class life, raise his family in a middle-class situation. Lots of African-Americans on the front lines, losing a limb or seeing their comrades and best friends lose their life on the front lines and did not get access, or an access that they could actually use to get to the GI Bill. Housing, red lining. The Federal Government basically said, “We’re going to invest in mortgages, in these neighborhoods and not in these neighborhoods And guess what these neighborhoods were? They were where black people lived. And, I mean you could say, “Well, maybe that was class.” Someone would say that. Someone who didn’t know would say, “Of course the Federal Government’s not going to guarantee because that was an area where they would have high losses because people were poor.” It’s like, “yeah, lots of evidence to suggest something opposite.” Like in Atlanta, where all the professors of Morehead College, very educated black professionals making good salaries. Their neighborhoods couldn’t get mortgages, and poor white neighborhoods could. So you had professionals making good money not get mortgages. Poor white people, who were really a financial risk, get mortgages. What’s the difference? Black versus white. American public policy that elevated a support of whites over blacks. It’s history. It’s true. Now there’s tons of books about it. There’s The Color of Law, there’s The Color of Money. These are books that go into great detail about this public policy that actually disadvantage generations of people of color and African-Americans. ANGELA: But you have people today, especially whites, who will say “Come on, they had civil rights legislation. They have the same opportunities we have today. That’s the past. It’s not our fault. Leave us alone. I don’t want to talk about it.” What do you say? BRIAN: I try to meet people where they are, and I try to get them to understand some of the data, because this is all data. I think we have to do a better job as a community of understanding what holds people back. Changing systems that unfairly hold people back, and then giving the supports so people, through their grit and discipline and hard work actually can overcome these barriers that hundreds of years of American prejudice and bad and public policy have created. ANGELA: I see that CICF wants to create neighborhoods and environments that empower people, change unfair systems and dismantle institutional racism. That’s a tall order. Why does CICF want to tackle this huge issue? And is it possible to dismantle racism? BRIAN: First of all, those words are chosen very carefully. Dismantling is not taking a sledge hammer and destroying it. I wish we could. If we could do that we would. We would do, ‘destroy institutional racism.’ But dismantling is … you look it up, it means picking apart. Taking it apart over time. That’s more realistic. ANGELA: CICF cannot do this alone. How do you do this? What are some of the steps forward? And partnerships and all of that matter in this as well, I’m sure. BRIAN: Yeah. Of course, we can’t do it alone. One of our really important partners in this work is the Indy Chamber. I’m lucky to be on the executive committee of that board. And they’re doing incredible work. They’re working with the Brookings Institution and showing … And with great data, again. It’s all data based. That we are, in Central Indiana, we are leaving billions of dollars of potential economic development … We’re losing that potential because we have so many people living in poverty. They’re arguing, as they should as the Chamber, the business case for closing the opportunity gap. The more we can get economically disadvantaged people to have living wages, the more they have wages where they can actually have a family and support that family without public support, everyone wins. Everyone wins. That’s the business case, and that’s based on data. ANGELA: As an African-American, and I am one, you still … Does the data show that they have less of a chance, people of color, in getting opportunities than even some of the poor whites? BRIAN: Absolutely … Yeah. So there’s no doubt. I don’t have all the data in front of me but I know, instinctively, it’s a lot harder, right? BRIAN: To live in a better neighborhood with better schools, to get mortgages. Absolutely. No doubt about it. The facts … Absolutely … And that’s what we want to overcome. Those are systems, societal and public policy government systems and decisions that helped white people and disadvantaged people of color. ANGELA: That’s part of the systemic racism that you’re trying to stop here? ANGELA: Institutional racism and systemic racism. ANGELA: I did hear you say, “We can’t shy away from racism and that America, including Indianapolis, has done a horrible job of confronting its racist past.” So, can you talk more about that. BRIAN: Yeah. So, I mean, you know, to have an intelligent conversation about whether racism and racist public policy and racists systems, or hold people back, you’ve got to share the fact that these exist. You got to, actually got to show people in history that these actually do exist and they still exist. So, we have to educate people, make people aware that these systems are still holding people back. There are still systems and actually … And the … I think there’s … I’m really starting to understand through my own readings and my own education that there’s like generational trauma. BRIAN: So, you put a family of color and the kids grow up seeing their parents losing hope because of the racism they’ve confronted and the lack of opportunity that they’ve confronted and then those kids grow up and have kids … This is trauma. BRIAN: It’s generational trauma. Generational racism, lack of opportunity trauma handed down from one family to the next family. That’s powerful and so, I think we have to acknowledge that’s real and what are some of the ways that we can help families overcome that? That when you, in that intense moment of delivering a baby, that your body shuts down out of a sense that it’s been worn down by the anxiety and constant daily stress of racism. ANGELA: Studies to back it up. BRIAN: Studies … That are starting to point to that. ANGELA: So, what are the next steps? ANGELA: Brian, why should people care? Why should they care about your new mission? BRIAN: Well, I think people should care because this idea of the American dream is something that I think is a bedrock of what we are as Americans and it is at a 100-year low. So, it is in danger of disappearing and if we care about America we should care about this idea that anyone can make something of themselves if they work hard enough and that we should have systems that actually create a playing field that makes that possible. That’s number one. I think that’s kind of the moral, patriotic, societal imperative. ANGELA: Are you scared especially with the politically-charged divisiveness today around race and so many issues that we might go backwards? BRIAN: It’s very possible but you know I’m an incredible optimist and I actually have had these conversations in the last week and thoughts in this last week that I don’t like where we are. I don’t like this divisiveness that we have. It’s actually bringing a lot of anxiety to me on a daily basis. But I sometimes wonder … You know it’s like that cliché of, which is true, that’s why it’s a cliché, is that don’t let a great … Don’t let a crisis go to waste. I think we are in a crisis, but I don’t think we could have this … We wouldn’t now be having this conversation if we weren’t in crisis. BRIAN: I actually think the idea that all this data coming out about this stuff is because we’re in an environment where we need to know what’s deeply going wrong. So, this is actually this crisis of divisiveness is creating the opportunity to do something better long-term. ANGELA: CICF talks a lot about this as an exclusive black and white issue, literally. Are you excluding the challenges facing other races and adversities or ethnicities, I should say? BRIAN: Whether you’re white, brown, Asian and black, we want everyone to have the opportunity to reach their full potential. You never know what life will throw at you. So it’s not like it’s a smooth run for everybody or anybody. But, we have learned that if you’re poor, if you’re of color, there are so many more barriers. ANGELA: With all that you’ve learned, what about CICF? How are you changing your own culture internally? BRIAN: So, we learned in Undoing Racism that we are a gatekeeper and that we are an old-power institution. So, we are knocking those doors and walls down as fast as we can to become a blend of new power and old power and an organization, and we’ve done a very good job of this. We’ve promoted a wonderful, bright, connected woman, Pamela Ross, who was one of our community investment officers and has had a long, long leadership journey here in Indianapolis in the not-for-profits. She’s our new Vice-President of Opportunity, Equity and Inclusion and the work that she’s already doing since April 1st is profound and she’s been very well received in the community, all communities, as a very important player in this community. ANGELA: Brian, when you look ahead 10, 20 years, what do you hope is different in Central Indiana led in part by your new mission? BRIAN: Well, 10 to 20 years from now, first of all, very few people are living in poverty. Right now, we have about 22% people in Indianapolis living in poverty and a much higher percentage of children. So, I would, I don’t know if we’re ever going to eliminate poverty like, but I would hope that that is a very small single digits, you know? That very small number of people living in poverty. That everyone who works hard. Everyone who works hard and seizes opportunity and has the discipline and grit to overcome challenges, course there’s always going to be challenges for everybody, that when you do that you can emerge and have a job and a career that supports a family and you can get up every day and think that maybe tomorrow can be better. That we are a community where hundreds of thousands of more people have that world reality, that daily reality of hope and ambition and progress and that that comes from a community response to, not just what we’re doing now, but to what a lot of people are doing now based again on this incredible data that we’ve transformed this community in where people who do work hard and can have the opportunity to reach their full potential and highly achieve for themselves and their families and the generations that come after them. ANGELA: They all get an equitable opportunity. BRIAN: That’s what we want is an equitable opportunity. To have a level playing field. BRIAN: All right. Thank you. ANGELA: Thank you so much, Brian, for sharing the profound work CICF is doing with help from wonderful community partners. To learn more about CICF’s new mission, and for links to research and books mentioned by Brian in today’s episode, visit cicf. org. Great presentation, Brian. This is a listening and learning process for all of us. I look forward to hearing more. Wonderful, insightful dialogue and exchange. so glad to know that CICF has engaged such an important, timely charge, and… that they’re intent on disrupting bad policy and replacing it with good policy. the u.s….the world cannot afford racism. excellent job!